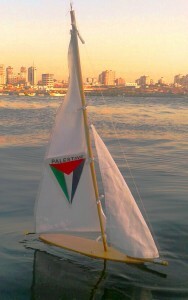 A mini-Ark is a 40-cm long wooden model boat that represents the Gaza’s Ark (to read up on this project, see here). On November 30th children from Gaza will be able to take these little boats and send them off into the sea. Children are the ones worst affected by living under the shadow of the occupation and the blockade. By launching the mini-Arks into the ocean, they will get a chance to do a symbolic act to signal their existence to the outside world and thus to participate actively in a gesture of resistance and hope. Check out this link, and please consider sponsoring, or co-sponsoring, one of them!